Here is an easy way to stay hydrated, and the kids will love it, too! 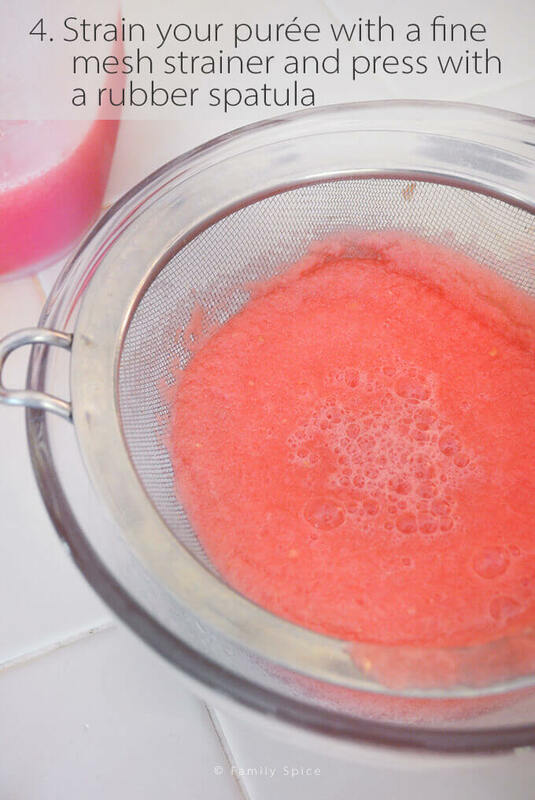 Step-by-step instructions on how to make watermelon juice. I don’t know about you, but we consume massive quantities of watermelon during the summer months. I love that it is so kid-friendly and easy to share with friends. It is also packed with water, so it keeps us all hydrated while we are sweating it out in the heat. 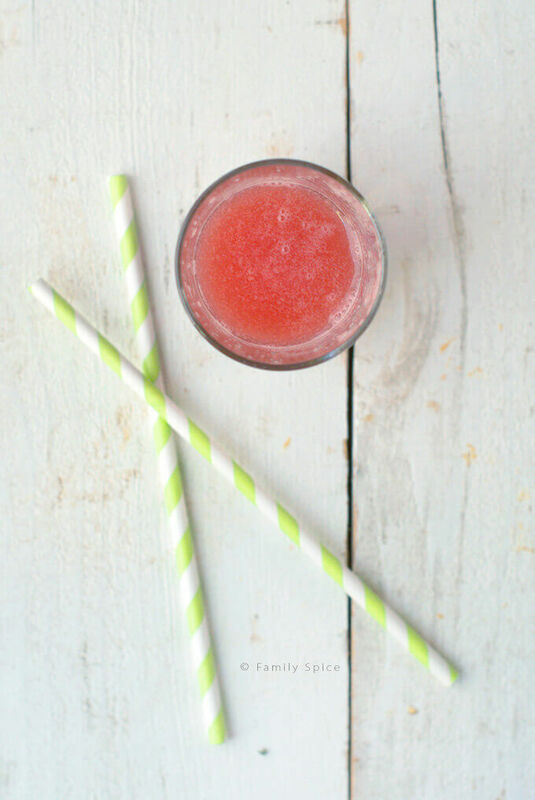 Today is National Drink Watermelon Day and I am going to share with you my family’s favorite way to beat the heat. 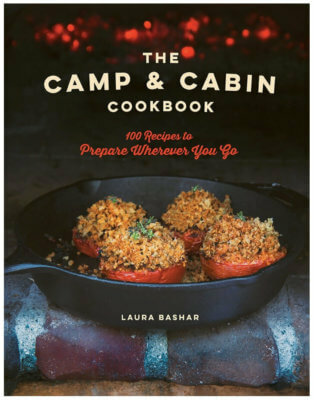 I have been using watermelon juice in cocktails (like my watermelon shooters with olive oil). 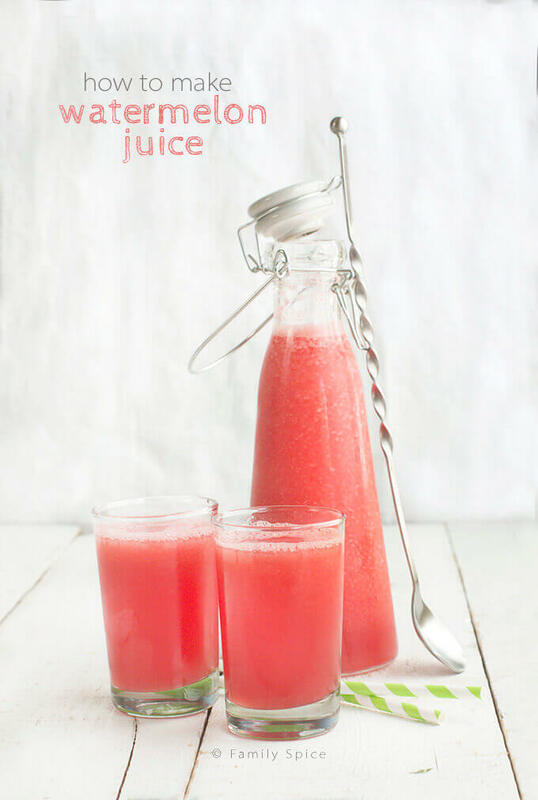 My kids started getting upset because the pitcher of watermelon juice in the fridge was typically spike with vodka – oops! So I made a pitcher of watermelon juice JUST FOR THE KIDDOS. And this my easy way to make watermelon juice. Cut your watermelon into 1-inch chunks. What you don’t have a cute watermelon cutting board? 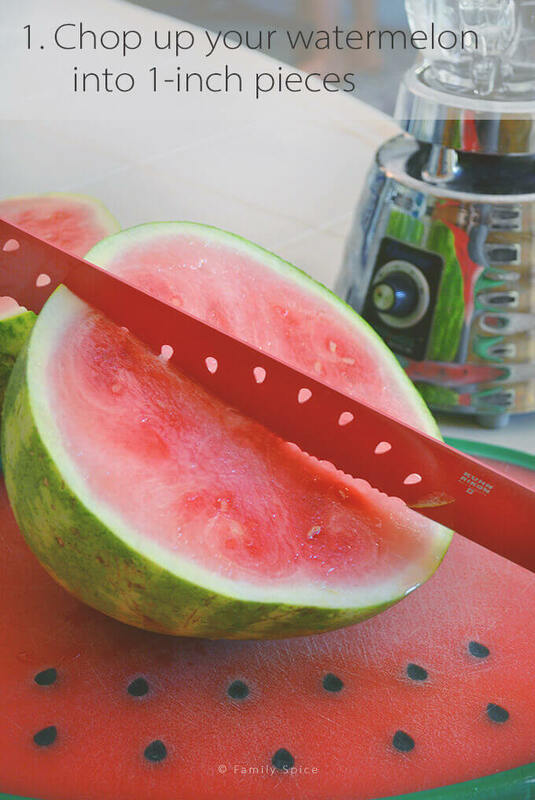 I have to say that this watermelon knife is super handy in slicing up watermelon FAST. 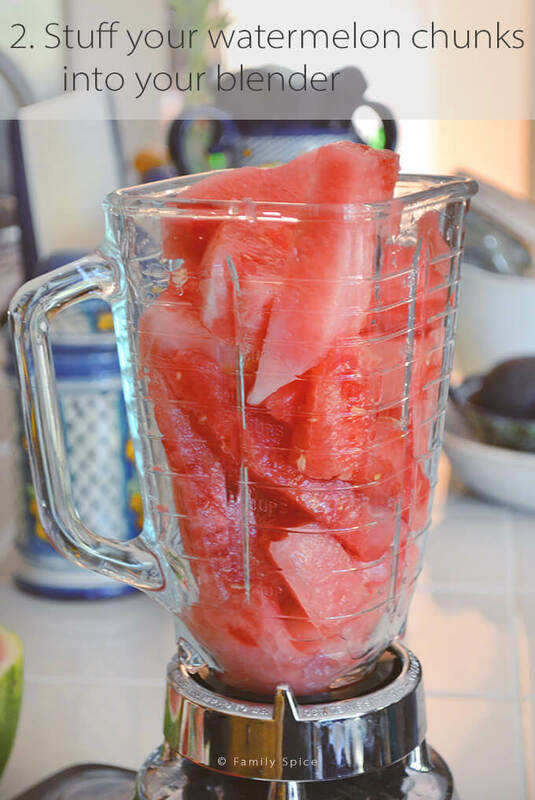 Stuff your watermelon chunks into a blender – and I mean STUFF IT. Don’t be shy. Shove those pieces way down. Because when you start blending, you want it to purée quickly. Add a little water if you have troubles. Turn the blender on high and go, Go, GO! Now, if you like it thick and your watermelon is seedless, you can slurp it up at this stage. But I like to strain out the seeds and pulp for a more juice-like consistency. Pass your purée through a fine mesh strainer and use a rubber spatula to press everything through. And what you have left is dreamy watermelon juice. A 10.5-pound seedless watermelon will produce about 3-quarts of watermelon juice. I usually don’t serve my watermelon juice until it has been refrigerated for a few hours. I like it nice and cold. After you pour it in a pitcher, make sure you seal the top with a lid or plastic wrap. It should be cold after 3 hours in the refrigerator. The kids just love watermelons and watermelon juice. It really is the perfect way to stay hydrated this summer, especially on National Drink Watermelon Day and STAY HYDRATED! Cut your watermelon into slices and remove the rind. Cut the remaining watermelon pieces into 1-inch chunks. 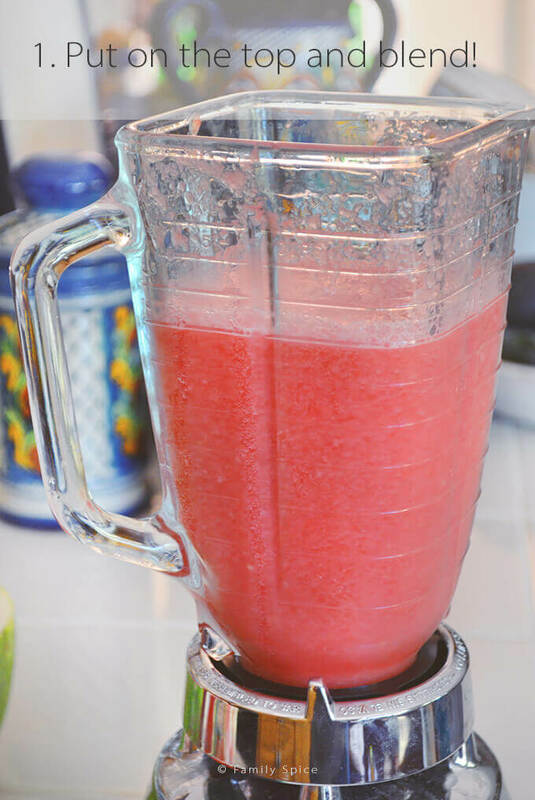 Stuff blender full of watermelon chunks and blend until smooth. Pass your purée through a fine mesh strainer placed over a bowl and use a rubber spatula to press pulp and juice through. Juice will collect into bowl. Transfer juice to a bottle or pitcher. Repeat with the rest of the watermelon chunks. Disclosure: I was given a small stipend from the National Watermelon Promotion Board to buy the ingredients for my watermelon juice. If I didn’t like it, I wouldn’t blog about it. This post also contains Amazon affiliate links. watermelon is definitely my favourite juice flavour EVER. so craving a glass right now! Looks fabulous.. I am already feeling thirsty.. Can I have a glass too please?? Sorry, my kids drank it all up! Enjoy! I am in total agreement, watermelon juice is fantastic and so refreshing! Since I’m half-Persian, cucumber and mint is a combination we love! Great idea, Joana! I have a juicer can I do this in it? From what I read online, yes, you can use a juicer to juice a watermelon. So glad you liked it! You are very welcome. really good for a summer party with a shot of vodka!!! How can I preserve watermelon juice for long shelf life in a glass bottle . It should last about a week in the refrigerator in a sealed bottle. Unfortunately it is a perishable item and won’t last longer than that. I love the facts that there is no added sugar!